America’s love for wine continues to grow. A U.S. Alcohol and Tobacco Tax and Trade Bureau report reveals that more than 835 million bulk gallons of wine were produced in 2014, up almost 1.7 million gallons from 2010. For those unwilling to do the math, that amounts to consuming more than 21 billion, five-ounce glasses. While California still leads production at 709,647,220 bulk gallons annually, Illinois produces 373,089 gallons—enough for 9,551,065 five-ounce glasses. 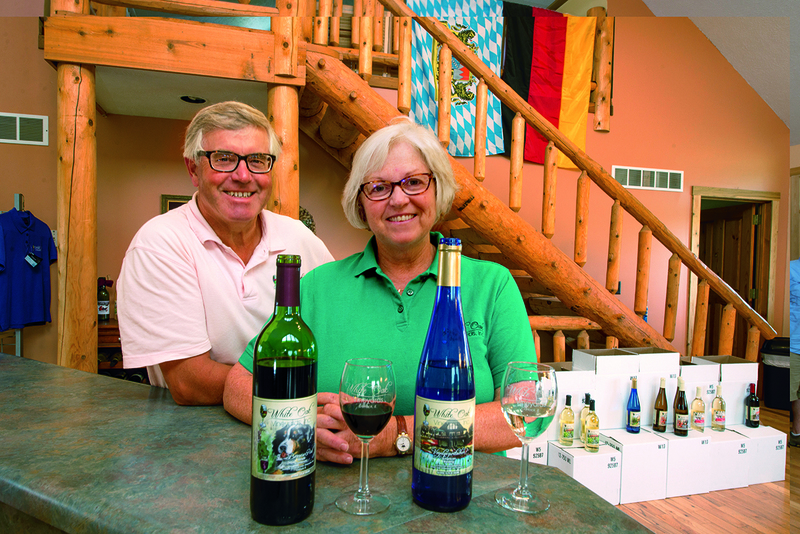 Among those meeting the demand are Central Illinois winemakers Mary (Mouser) Hofmann ’76 and her husband, Rudi, who operate White Oak Vineyard in Carlock. Their passion for operating the business just northwest of Normal was the culmination of a lifelong dream that took them across the world and back again. Mary grew up on a farm that bordered the old university farm in north Normal. Her home’s proximity to campus made the choice to attend Illinois State an easy decision. She enrolled as a music major intending to study vocal performance. The major required students study a foreign language. Her father suggested Spanish, but she chose German. 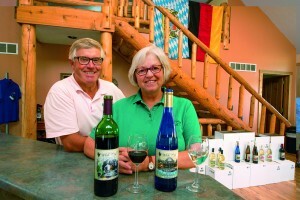 Mary and Rudi Hofmann enjoy meeting with visitors from around the world in the tasting room, which is decorated to proudly display the couple’s German ties. Mary fell in love with the language, something she attributes to ISU professors Wolfgang Pfabel and Jim McEntyre. She changed her major to German and immersed herself in the language, traveling to Germany with a group of students. It was there another defining moment occurred. Mary became acquainted with Elizabeth, who worked at the guesthouse where the group stayed, and the two continued to correspond after Mary returned to the United States. During her final senior semester, Mary received a letter that her friend was coming to Minnesota for Farm Fest ’76, the largest farming exhibition in the United States. She would be traveling with her brother-in-law and his brother, Rudi. The visit the ladies arranged resulted in Mary meeting her future husband. The relationship blossomed when Mary took a translator’s job in Germany in December 1976. She worked at a company close to where Rudi lived in Ebrach, allowing the two to reconnect and eventually marry in August 1977. Over the next 23 years, Mary and Rudi made a life in Germany. While raising their two children—Stephanie and Michael—Rudi was managing his woodworking business and Mary worked in translation and teaching English. In 1986 she joined Delta Air Lines in Munich as the assistant to the manager, but was transferred to inflight services in 1998. She primarily flew international routes as Purser and German and Dutch speaker. It was then the couple decided to relocate closer to her Illinois family. They also decided it was time to realize their dream of farming. “Ever since we met, we knew we wanted to do some sort of farming,” Mary said. 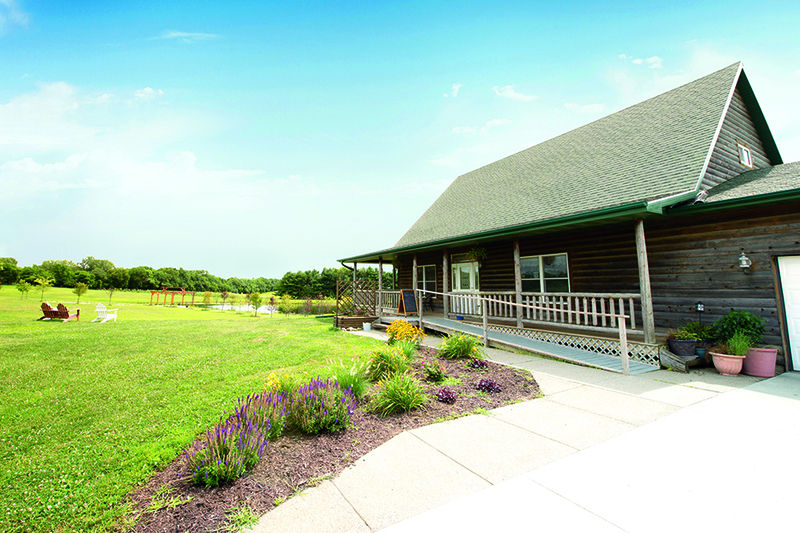 The design of the tasting room allows guests an opportunity to enjoy the peaceful surroundings of a Central Illinois landscape. They bought seven acres in the White Oak Township, land that was set to a corn and soybean rotation. They began exploring an alternative crop, considering everything from strawberries to ginseng. During a drive through Mackinaw Valley, they saw grapes planted and stopped to speak with the vineyard’s owners. That was in 2002. Today they own 22 acres, with 12.5 of them on the vine. 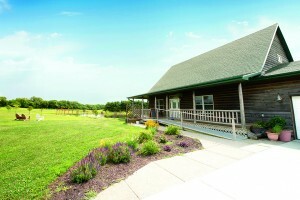 Two houses sit on the property, with a remodeled log home serving as a tasting room. The large wrap-around porch is perfect for guests to enjoy a quiet afternoon sipping on one of 15 wines. The idyllic building with sweeping views of the vineyards offers visitors a place for peace and relaxation. “We find that when people come out here, they tend to relax. They talk with people they haven’t spoken with before. That’s what we enjoy—seeing perfect strangers sitting out there and getting to know one another,” Mary said. 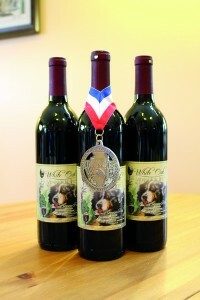 The wine’s label features Moritz, one of two dogs who roam the property as the official mascots for the vineyard. 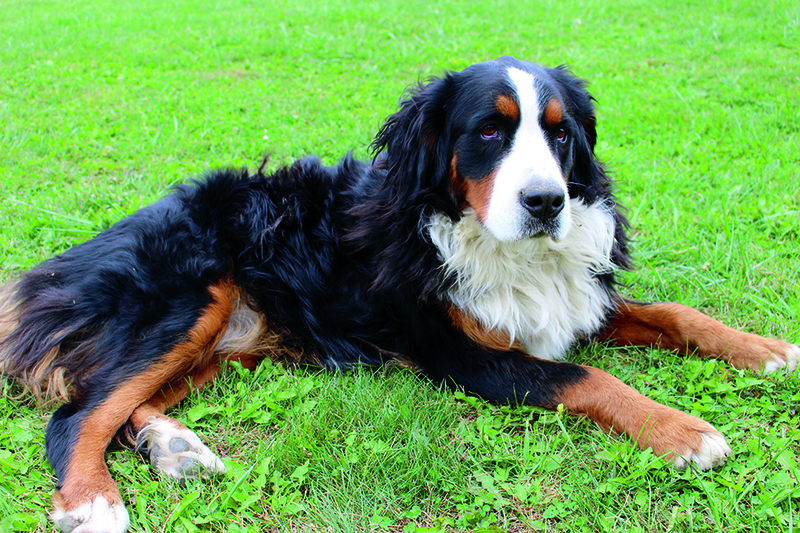 She and Rudi keep their focus on the time and energy that goes into perfecting each drop of wine. They tend more than 6,000 plants across their vineyard. All of them were put in by hand, primarily by Rudi. He attended several viticulture seminars sponsored by the Illinois Grape Growers Association and Southern Illinois University to learn exactly what needed to be done. The task is arduous, so much so that finding help with the process is difficult. Planting the grapes is just the beginning. They must be trained up a bamboo pole and across a wire, or trellis, as they grow. It can be three to four years before the grapes are useable, during which time the smaller grapes must be plucked off and the vines tended. After that there is mowing and weeding, as well as behind-the-scenes administrative duties such as marketing, bottling, labeling, and licensing paperwork. Labeling itself can be a complicated process. Each label must be approved by the federal government, which can take two weeks to several months. Though the initial idea was to grow grapes and sell them to local wineries, the Hofmanns decided to enter the world of winemaking after the demand for grapes from other wineries decreased. Having no previous winemaking experience, Mary enrolled in an online program at University of California–Davis and traveled to the campus for several semester seminars. She completed her training at the University of Missouri–Columbia. “The certificate is just paper,” Mary said. “You don’t learn anything until you’ve made enough mistakes and learned what you did wrong.” Such real-world lessons are shared with students from ISU’s Department of Chemistry. They welcome the chance to partner with the two, who have perfected their process in part by staying close to their roots in Germany. 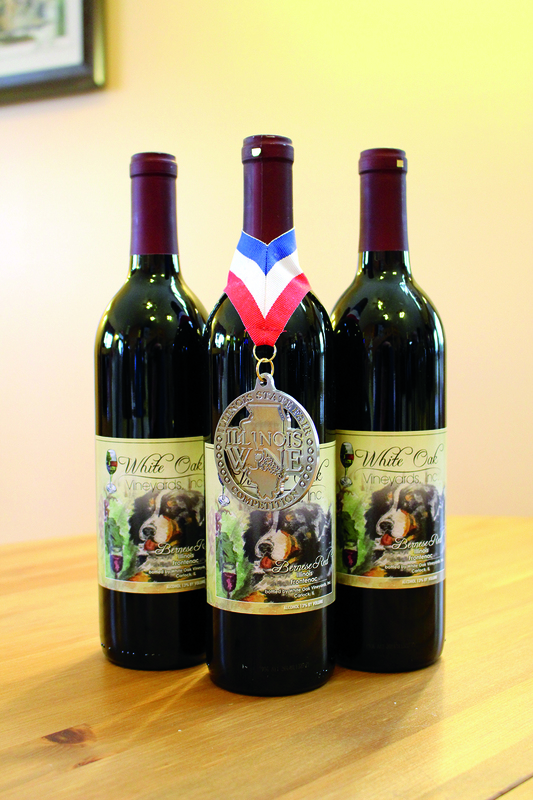 The winery’s Bernese Red-Frontenac bottle captured a silver medal at the 2013 Illinois State Fair Wine Competition. They employ a European winemaking style, allowing wines to ferment on their own as much as possible so that their natural flavors can surface. Occasionally Mary will select certain yeasts compatible with a particular variety of grape to uncover a hidden taste. For the most part, she avoids adding flavoring. Despite the intense labor, Mary and Rudi continue to delight in sharing their heritage through wine with individuals from around the world. Many are surprised and impressed to realize California is not the only place for quality wine. Visitors also marvel at the personal story of how Mary and Rudi literally planted their dream. Their journey reveals the couple’s passion and patience—both of which remain a key ingredient in maintaining a successful winery in the middle of corn country.